The Volkswagen GLI has always been fun. Lack of fun was never the issue. But it’s suffered from two problems, one long-running and one more recent. The first is that the more practical GTI hatchback exists, making the GLI a permanent also-ran. And the second is that, being a Jetta underneath, the last GLI rode on a dated, older platform when the rest of the VW world moved on to that sweet MQB goodness. 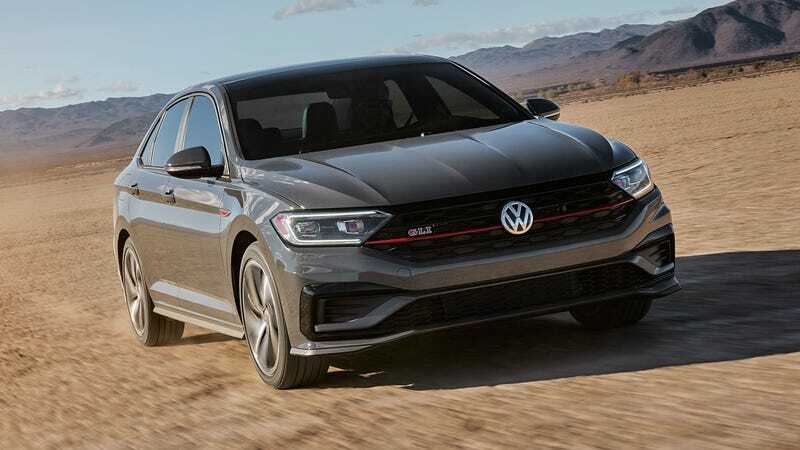 Meet the all-new 2019 Jetta GLI, which has more power than ever and takes care of one of those issues. The new GLI was unveiled today at the Chicago Auto Show, which is somehow more newsier than the snoozefest that was the Detroit Auto Show in January. As with the new Jetta, which we rather like, the new GLI does in fact ride on the up-to-date MQB platform, arguably the best small car architecture in the world at present. With a bevy of tech, racier looks and 228 horsepower and 258 lb-ft of torque from the 2.0-liter turbo four, it sounds like a fun little sedan. Even better news is the fact that, like the GTI, you can have this baby sport sedan with a six-speed manual or the extremely good seven-speed DSG dual-clutch automated manual. You can’t go wrong either way! You get a lot of nice stuff on the hot Jetta, too: standard LEDs with LED DRLs, brakes from the Golf R, available black wheels with red stripes on the 35th Anniversary model, an all-around independent sport suspension, VW’s electronic limited-slip differential, and things like automatic climate control and rain-sensing wipers are standard. Pricing hasn’t been announced yet, but like the GTI we expect it to start in the mid to upper $20,000 range. We all know the GTI is often the target to beat in that segment, but if you love sedans and want something a bit different, this is a compelling proposition once again.